6 en-suite cabins with a large (3’6”) lower berth and a standard (2’6”) berth above. All berths are 6’3” long, have under floor heating, heated towel rail, good storage and a large opening window. Bed linen and towels are provided. There is plenty of hot water and the showers are good and powerful. In addition to the en-suites there is one toilet/shower and one toilet in the forward passageway. 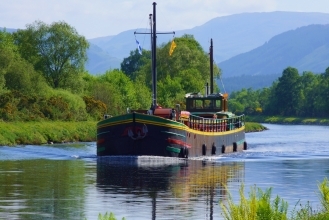 Fingal of Caledonia has 7 steep steps down from the deck into the boat at both ends. These have good handrails and we are very used to helping people up and down but the boat is in no way wheelchair accessible. Down below in Fingal there is a single step down into the cabin passage and single steps up into the en-suite and again into the shower. When we are at anchor, access to and from the shore is by our smaller RIB support boat. Access to this boat is by a short ladder up to Fingal’s deck. Guests must be able to climb a small ladder. This is for safety regulations so that persons can evacuate the barge in the event of a fire or other emergency situation. Mountain bikes and open canoes as well as wetsuits, buoyancy aids, waterproofs, helmets etc. In the dining/saloon area there is a large dining table which can seat up to 18 and comfortable seating to relax on. The whole area is central heated and there are opening windows. There is plenty of space on the deck for relaxing and sun bathing.